Arrive At Leh Airport and transferred to hotel. Check in the hotel and relax for some time. Rest of the day is at leisure and you can also visit Leh Palace, Shanti Stupas and Leh Market for shopping. Later back to the hotel. Overnight stay at the hotel. 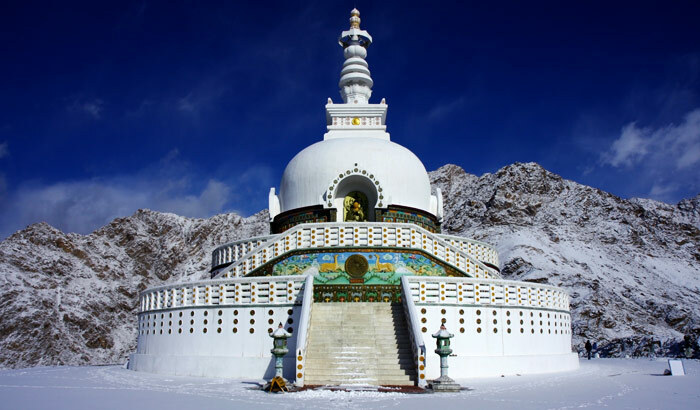 After Breakfast take a full day c sightseeing of Leh which covers Shey Palace, Thiksey Monastery,Hemis Monasteries and Stock Palace Museum.In evening back to Leh. Overnight stay at the hotel. After Breakfast check out the hotel and proceed to Nubra Valley via Khardungla – highest Mootorable road in the world. On arrival at Nubra Valley check in the hotel and relax for some time. Rest of the day is at leisure to explore the Deskit Monastery, Hunder Villages and you can also enjoy the camel safari in Sand Dunes between Deskit and Hunder Village. Later back to Nubra valley. Overnight stay at the hotel. After Breakfast take a half day sightseeing of Deskit Monastery. On arrival take a magnificent view of Nubra Valley. Later back to Nubra valley after some rest check out the hotel and proceed to Leh. On arrival check in the hotel and relax for some time.Overnight stay at the hotel. Prices valid from 01st April 2014 to 31st March 2015. If you have not decided yet or wants to customize tour itinerary or hotels listed above in "Explore Valley Of Flowers Package With Goair Airlines", then we can change the travel itinerary and make a personalized, tailor-made holiday package, especially for you. We can modify this travel package as per your itinerary, budget, duration and the tourist places you would like to visit, including transportation and airfare should be included or not. Please fill the form below to contact us.